I looked down just in time. "Oh, come on!" I screamed to the heavens above. "This is getting ridiculous!" Okay, so I am not the nimblest of people; I have acquired a reputation for slipping, stumbling, tripping and tumbling. I still have bruises from falling down stairs and on icy sidewalks. If I didn't know better, I'd swear the Cosmos is blatently ensuring further pratfalls a la Wile E. Coyote for its own sick entertainment. Maybe someone had a hidden camera and if you had slipped on it you could have won $10,000 or something. Hey, you never know. Yes, the world is out to get you. Now watch out for someone hiding behind a door with a creme pie. It's possible that your whole life is a slapstick movie and that somebody is constantly filming you. Some day it will come to all major theaters near you. I think you weren't supposed to have noticed that banana peel. Oops! Ah, but the important thing is, you saw it! Now you can pat yourself on the back and say "Well done Maureen. This time I beat it"
At first I thought maybe somebuddy is out to get you. Then I realized, maybe it was just left by a passing monkey. Who litters. Can you REALLY slip on a banana peel? I've never seen it happen except in cartoons. Now LEGOS on the other hand, I step on daily and about kill myself. Be careful. They put a banana peel on the ground so you won't be looking up to see the anvil crashing down on your head. 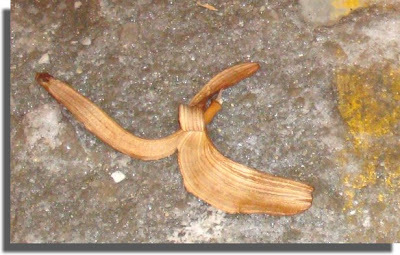 Console yourself with the thought that banana skins really don't slip that well on dry concrete! See? The universe was giving you a sporting chance! LOL! Watch out for falling anvils!! I'm back again! Love your blog. I have something for you at my blog. Check it out! You might want to lock your frying pans away, too. As an expert, I can tell you that this is the infamous 'ACME Extra Slippery Comedy Banana'. You're lucky your car didn't turn upside down. Are you kidding? Me and the Cosmos simply shared breakfast that morning. I am a banana hawk (?) and I'm certain anyone named Cosmos must be. I'll pick up the peel next time. Sorry. sometimes, we dont realize that human has very bad habit than monkey..
Kathy: Ha! Thanks for the Stumble, Stumble Queen! Tony Single: Okay, so how the heck am I going to avoid ALL doors now??? Babs: THIS time, at least. Daisy: Ahahahaha!!! Yes, a monkey who litters is right! 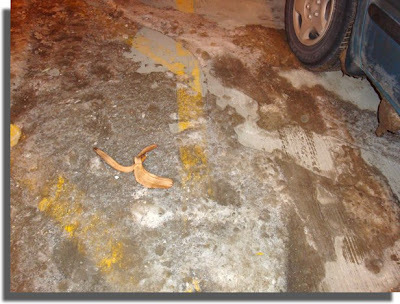 I mean, who the heck just eats a banana (backwards, too) and simply drops the peel in a parking garage???? Mom Taxi Julie: Yes, I remember those days.... LEGO is the worst. Especially in the middle of the night. JD: Anvils! Nooooooo! Made by ACME no doubt. Jay: Ha! Well, it WAS sitting on ice in fact. Everything is covered in ice around here. Kirsten: Aw, thank you so much! I shall have to add your gift to my bling page!!! Be.Bart: Ah, I am so glad I have a professional here to help... next time I shall look for the ACME logo. Bruce: Sure, THERE'S chivalry for ya. Warren: I know; I really don't understand how people can simply drop garbage in the street and walk away. Animals indeed. Mary: Shhhhh! It might hear you!!! Vegas Princess: Well, NOW I'll be sure to look for one!!! !